But today, I’m gonna buck the trend and tell you about my day. There is a point buried in here somewhere, but it’ll take me a while to get there. Bear with me. My day started, unpromisingly, in Elephant & Castle. Not literally. I didn’t wake up there. But I was there, with my entire family, at 8:30 am which is pretty darn early. Too early, in fact, to be dealing with the crazies of Elephant. Specifically the gold-toothed fella who stood beside me chanting “Hello fatty, hello fatty” at me. Sod right off. That’s a baby under my coat. And some chocolate. At least Roo was happy. As we were walking there, he told us that his favourite animal was an elephant, and his favourite colour was red. So a giant red elephant made him very excited. You wouldn’t know that he’d been there literally hundreds of times before. 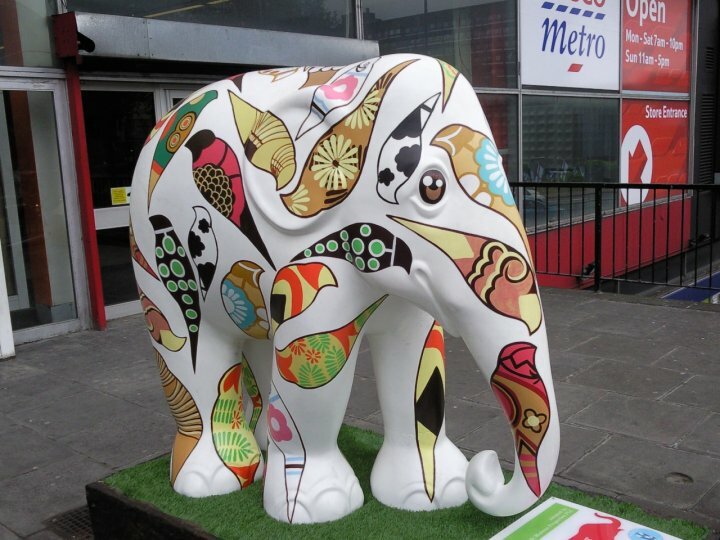 But sooner or later, he always realises that there are no real elephants around, just the world’s dodgiest shopping centre. It smelt, as always, of human urine..but I wasn’t one to judge, given that this potty I’ve been hauling around is starting to smell a bit. So, it helped us fit in. Anyway, we went to Tesco, failed to buy a cBeebies magazine, and then went to the bus stop with my disillusioned boy. Parental overpromising strikes again! We didn’t take many photos today, so have an arbitrary and very old picture of an elephant at Elephant. And now on with the story. At the bus stop, we witnessed some bad bus etiquette. I may have mentioned before how I dislike bad bus etiquette – I know it’s complicated, but some things are straightforward. Like if another buggy is at the bus stop, you let them get on the bus first. This morning, someone decided to flout that rule and shoved her way on, leaving me to do the complicated getting-past-the-pole manoevure with my giant buggy and potty attachment. I decided to ignore her, at which point Reuben struck up a conversation with her son. About apples! So, as we rolled down the Old Kent Road I was sitting next to someone who was ignoring me, but whose son was talking to my son and her, while my son was talking to her son and me. All very awkward. Not helped when a man got on with yet another buggy, which had to squeeze in between the two. She still didn’t move hers. This was still very early in the morning to be dealing with such social niceties. Eventually, we were last buggy standing as we climbed up the hill from gloomy Deptford to beautiful Blackheath. By then, I was sitting next to an older lady, who I’d had to have a short and awkward conversation with when Roo piped up “Who’s that sitting next to you? Is it a lady?”. Again I say, too early in the morning. Ever wish your toddler hadn’t learnt to talk? Anyway, we have reached our destination and the point of this post – the Greenwich and Lewisham Sling Library. It’s run by a friend of mine, and is a good place to drop in for a play with some slings (and the scary weighted doll) and some advice (there are toys out for marauding preschoolers) Cause, yknow, slinging around London is the best. And that’s the point I was eventually getting to. The stresses of taking a buggy on a journey like this morning have only made me appreciate more the joy of hopping on a bus with Eva and being able to sit anywhere we like. Or a tube or a train, or anywhere with steps. We were so nearly buggy-free before she was born. Roo was happily walking miles every day. But regression set in with the appearance of a sibling, and we reverted to the buggy. Then the extreme STUFF-ness of potty training set in, and now we need the buggy for the stuff as much as the potty-trainer. But if you have any choice at all, try slinging., It really is liberating. As you may have gathered, Eva is pretty much exclusively slung. The only time she goes in a buggy is during Mums-and-buggies exercise, and she tends to scream until she’s released from her cage, back into her rightful place. 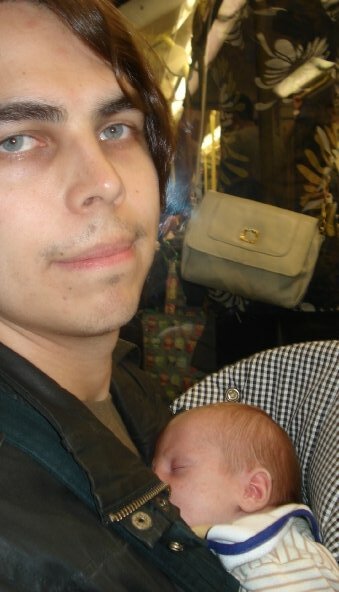 With Roo, we used a baby bjorn (see below), which isn’t as bad as these slinging-types make out, but neither is it super-comfy for either party. 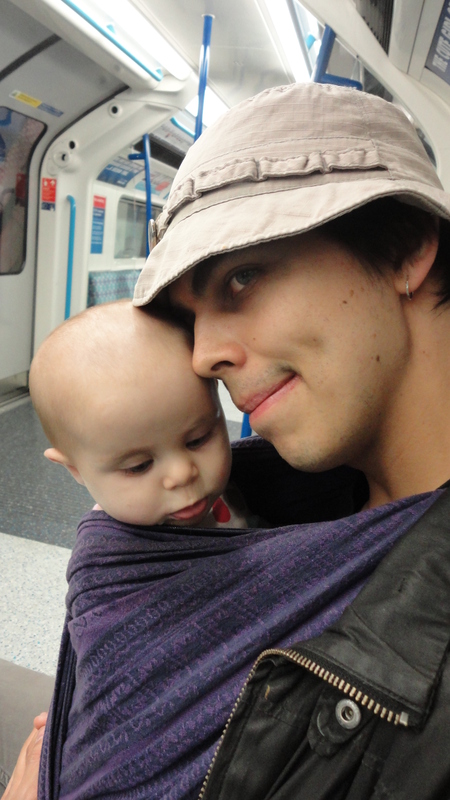 But it did the job, and we carried him around in it when we needed to use the tube for the first few months. Then we got a framed backpack carrier, which was just ridiculously heavy and only got used a few times. By the way, Nathan is gonna KILL me for using this photo. Doesn’t he look tired?! You can tell he hadn’t slept for a month. So much for trying to get a baby to sleep in their own bed. Compare and contrast with the fresh-faced, co-sleeping Daddy at the top. Yes, the crunchy mamas HAVE got me. 1) If you’re sans toddler, you avoid the stress of getting a buggy onto a bus. And then having to make conversation. If you can sling a toddler, you’ve probably never experienced this. Count yourself lucky. 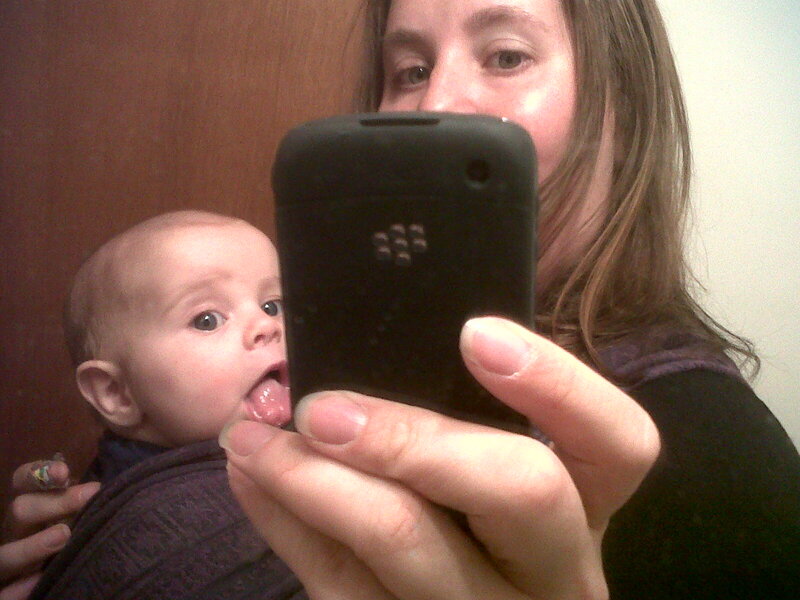 2) In busy places, it’s handy to know where your baby – and all their accessories – are. No-one can put their grubby hands on her face without you knowing, and you have a better (not a good – better) chance of catching their baby socks when they drop off. 3) You can use as many different forms of transport as you like, without worrying about steps. Again, this won’t work if you’re still dragging a buggied toddler round with you too. 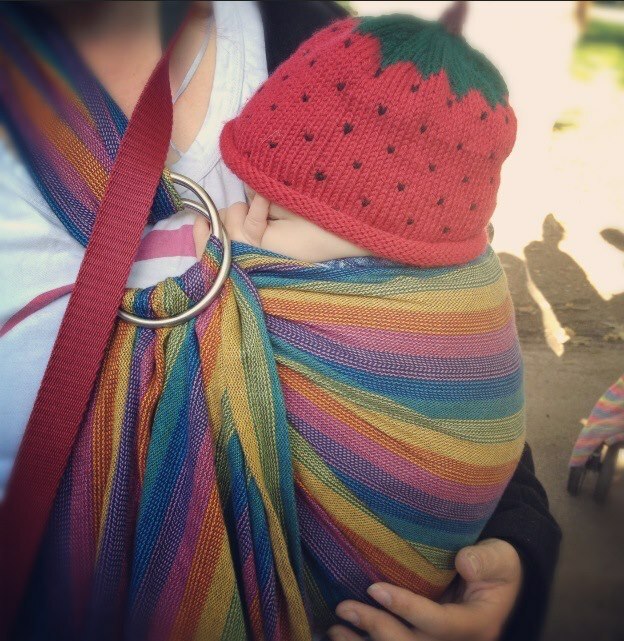 5) Wraps are so pretty and you can dress your baby to match. Except nothing matches a bright red Moby. You’ve probably got this far and thought – “well, I don’t have a baby. I only have a strapping toddler who won’t stay still long enough to be wrapped”. I say, get yourself down to a sling library and have a chat with someone who knows about things like Becos and Ergos. They might be able to help. I’m the last person to be a slinging fascist, but it really is useful for getting around the place. Oh, and if anyone’s wondering we went to two different branches of Tesco today. Good times. This entry was posted in Just wandering.... and tagged buses, slings, South London. Bookmark the permalink. Hi there. My Mums group and I are looking to start a monthly trip to London with our littlies (all around 14mths old). Any suggestions of fun places to take them, that won’t break the bank? Not having much luck finding stuff to do online! Hi Annette, thanks for the question. I’m on my eccentric BlackBerry right now (and my equally eccentric daughter is refusing to sleep), so apologies for the brief answer and lack of links…but my no 1 idea would be the toddler area at the Science Museum. 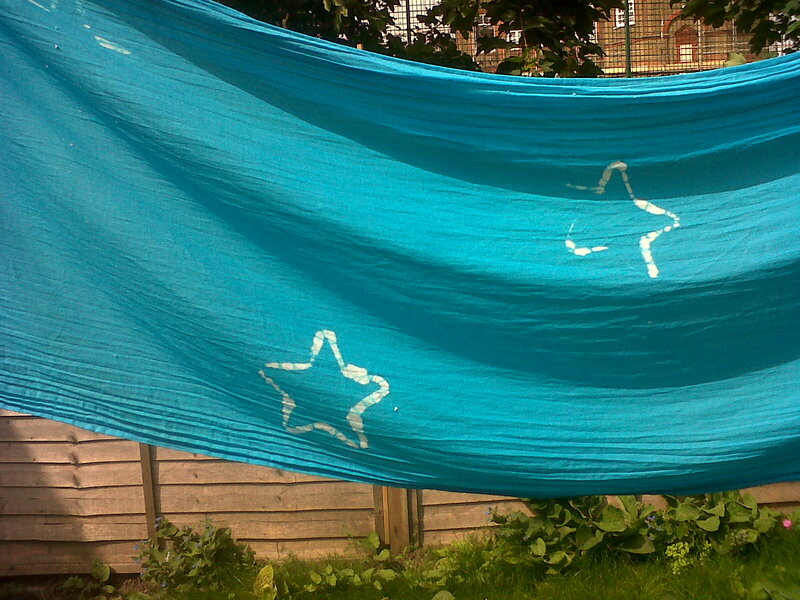 There’s lots of sensory stuff for littlies, and water play and giant bricks if they’re walking. I’m sure we took Roo there at around 18 months and he loved it. Corams Fields is good for all ages (first trip there was on his first birthday), but that might be a bit seasonal. Museum of Childhood is also good for just-walkers who want to have a runaround. And for a cup of tea or just a sit-down, you can’t beat the Royal Festival Hall (my son learnt to crawl up stairs there). Hope that helps! Do you mind if – copy this to my FAQs page? Hi Kate, sorry for delay in replying. Yep, feel free to copy to your Facebook thingy. I don’t have an account on there, but hopefully I’ll still get notified if people reply to your original thread. There’s nothing worse than some bad bus etiquette! Or people trying to touch your baby (it drives me crazy). 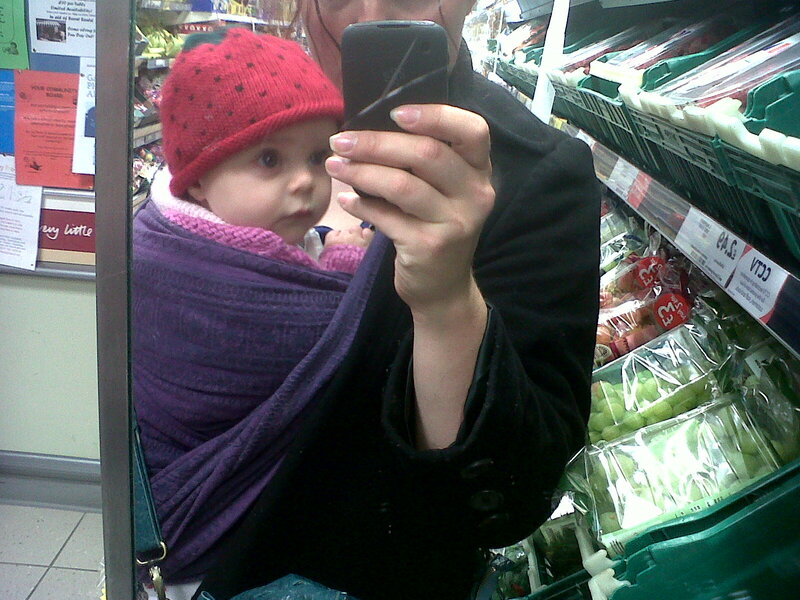 Really interesting to read about your slings, I’m looking to see if there’s anything suitable for E now she’a pretty much too big for the Baby Bjorn – there’s a south London sling library so we’re going to give it a try. Now I can go from admiring your sling fashion to admiring your writing. See you in the park soon I hope, or in one of these 100 places…. This is such a fantastic post-some amazing ideas!